There are an infinite number of backpack manufacturers these days so the choices are limitless when you want to find a pack that is right for you. 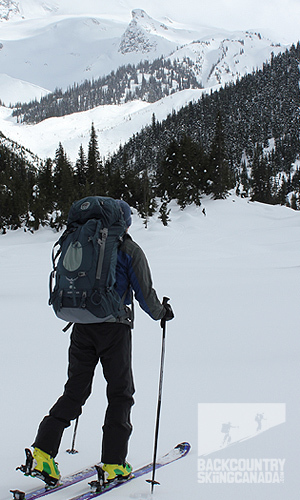 We went looking for a 75litre + pack ideal for multi-day ski touring and ski mountaineering trips. We had a list of features we required but after much research we were able to narrow the selection down to just a handful. We chose to review the Osprey Aether 85 pack due to several factors: design, quality, price, features and what we call 'the little things' (more on that later). 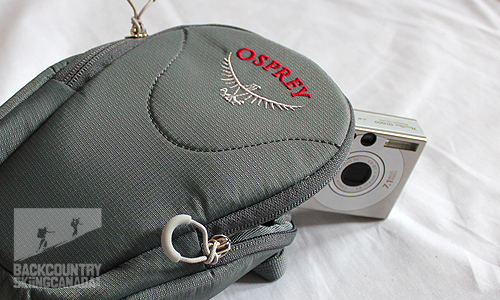 Osprey was founded in 1974 and each design is overseen by the founder Mike Pfotenhauer. The Aether 85 was recently redesigned in 2010 and is now in its 3rd generation. The Aether 85 utilizes an IsoForm™ harness and hipbelt which comes in 4 sizes along with three torso sizes for the Aether, making it a sure fit. 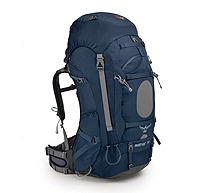 This is a pack designed specifically for men as the woman's version would be the Osprey Arial 75. At the core of the Osprey Aether 85 is a very light alloy peripheral frame along with a 210-denier double-ripstop nylon and 420-denier nylon packcloth body and 500-denier plain-weave oxford nylon bottom which all shaves precious weight, yet remains tough. 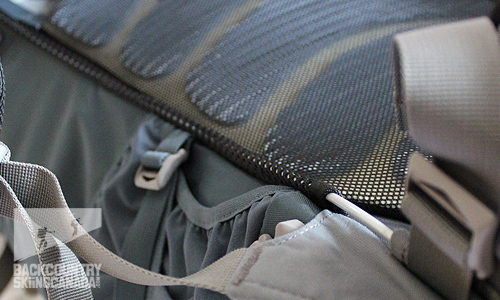 The Osprey Aether 85 pack has a number of feature patents which make it unique. Below we have listed all of the technical features and then discussed a few of what we think make this pack stand out from the rest. Hipbelt convertible top pocket/lumbar pack - a nice to have for travelling light but not applicable for ski mountaineering. LightWire alloy peripheral frame - keeps the weight on your hips and provides rigidity. 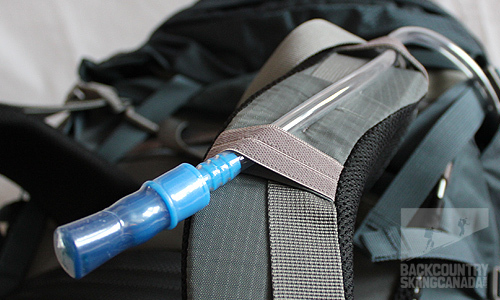 Hydration compatible - water bladder pocket with tubing access and straps (always a must). Red internal load compression strap - to stabilize the top of the load. Stow on the go trekking pole attachment - great idea for approaches and scrambles or when collapsable ski poles are just getting in the way. Three horizontal compression straps - steadies the load but impedes access to the J-zippered panel. J-zipper panel access - a useful feature to access your stuff with out having to go in through the top of the pack. 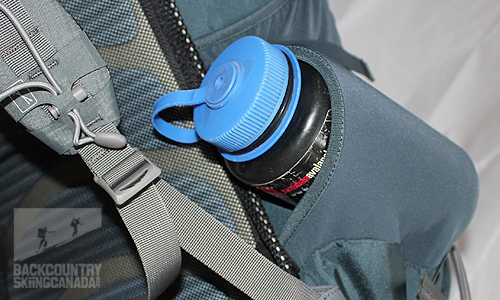 Stretch woven dual access side pockets - good for quick access items and the angled access allows for easy water bottle retrieval. Stretch woven front pocket with welded vent - great storage when delayering or for avi gear. Cord loop Add-Ons attachment slots - many add on accessories to choose from (see below for more info). StraightJacket compression - one strap provides multiple compression points. 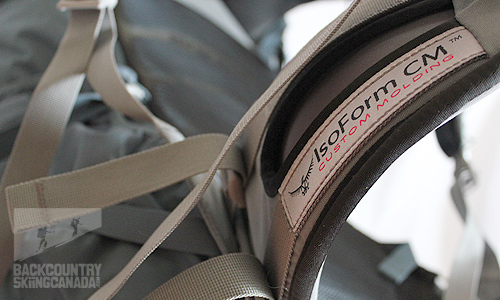 Side gear loops and straps - accommodates skis in the traditional a-frame configuration. 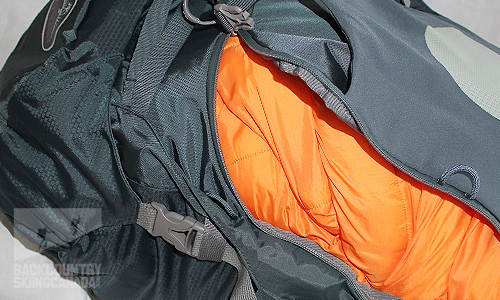 Wide mouth sleeping bag access with divider - provides easy external access to your sleeping bag. 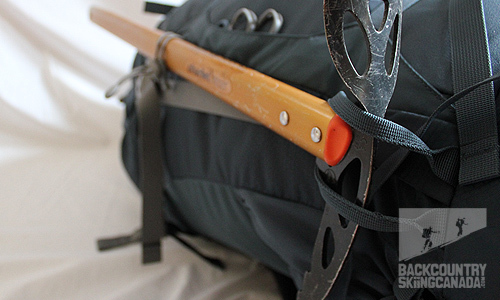 Two ice axe loops - accommodates two ice axes securely. 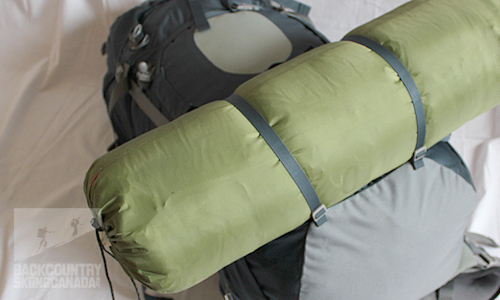 Removable sleeping pad straps - creates more room on the inside of your pack, removable if not needed. ErgoPull hipbelt closure - great for micro adjusting the hip belt with out getting a hernia. 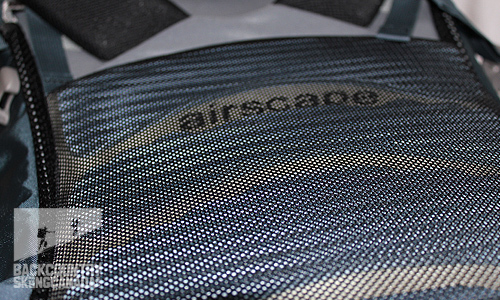 Promotes airflow and wicks away moisture during warm weather and intense activity. Provides extra leverage in cinching, drawing tension along top and bottom—not through the center—to relieve hipbone pressure. 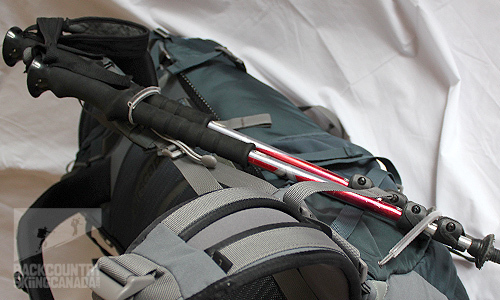 Makes packing and accessing your gear a breeze. 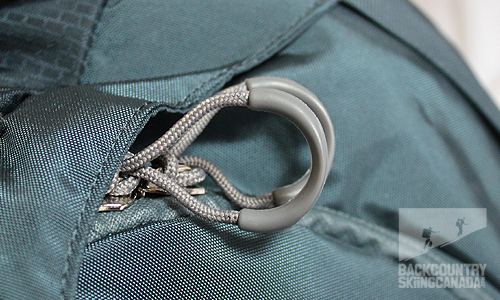 When you have big insulated gloves on these zipper straps are easy to locate and use. You should always have access to a whistle and this one is perfectly located and built right into the chest strap - genius. The Aether 85 utilizes an IsoForm CM hipbelt which comes in 4 sizes and is heat moulded in the official Osprey in-store hip belt oven to create a custom moulded hip belt specifically for you. Once this process is complete you can easily see its benefits as the hip belt is no longer vertical and straight but rather contoured to your hips and at an angle to conform specifically to you. I was initially skeptical of this feature but after going through the process this is a clear plus for the Osprey Aether 85. 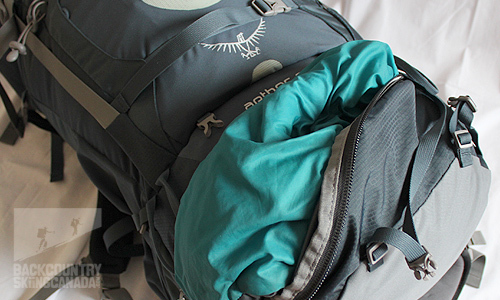 Osprey knows how to make a good pack better by providing a few 'add-ons' (purchased separately) which make your life simpler in the backcountry. This product is made for those epic ski mountaineering trips when you will need to bring along your crampons. The Crampon Pocket will help keep them safely stowed on the outside of your pack and ensure that the crampon points do not damage your pack. 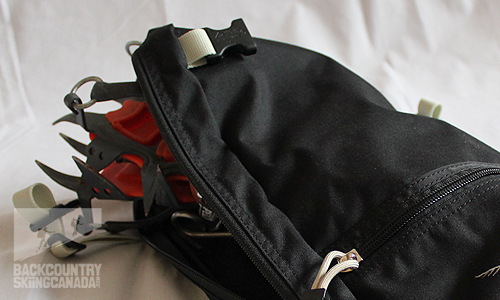 The Crampon Pocket affixes to the back of the Aether 85 and has a large zip access as well as a zippered stash pocket for parts or other goodies. 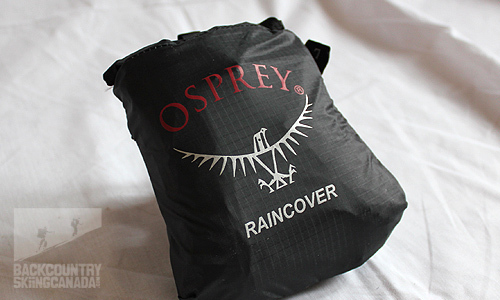 The Osprey UL Raincover for the Osprey Aether 85 backpack is a lightweight cover that stows in its own pouch. The cover is made of 40D coated ripstop nylon with taped seams and a drawcord closure system and a snap attachment. This is a must have item for any backpack, pass on this cover and you will be kicking yourself for days once the snow turns to rain and the contents of your pack gets wet. This is one of my favourite add-ons from Osprey. Each time the baggage check lady throws my pack onto the the conveyer and I watch it disappear I just hope it comes out at the other end in one piece. With a plethora of clips, straps and loops it is far too easy for something to get snagged in transport and your backpack is ruined. 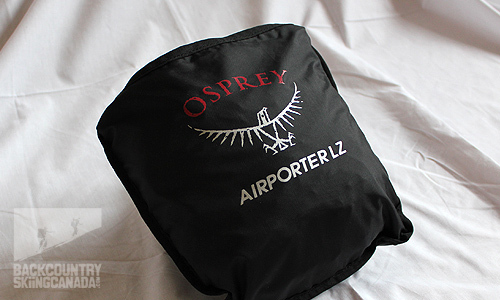 The Airporter LZ is designed to protect your pack and also keep it secure with its lockable wide mouth zippers. It is essentially a cargo bag to place your pack into while travelling. 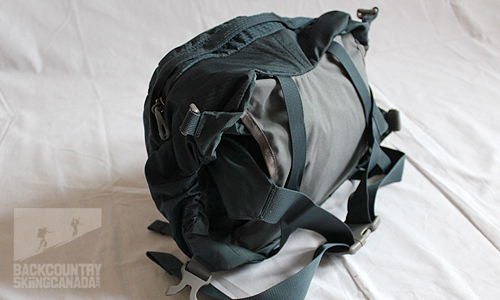 It is made from 210HD nylon oxford and has ample room to accommodate the Aether85 when fully packed out. There is also a built in ID window and shoulder strap - however I am sceptical that the shoulder strap would stand up to carrying a 50lb pack as it appear to be a little flimsy in its design/construction. 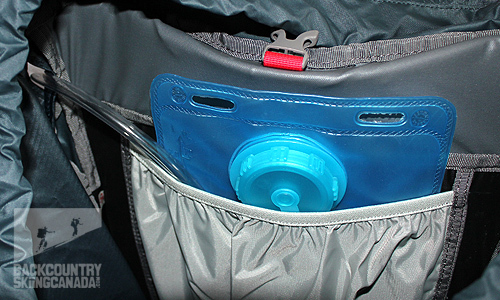 Weighing only 13 oz / .37kg and stowing down into its own pocket it is a small convenience to carry along. The Digi Stow ads 3.5oz / 100g to your pack weight but provides convenient access to any of your digital accessories that you may carry with you such as camera, mp3 player or GPS unit. It has a velcro attachment with double back security so it will not fall off on one of your yard sale crashes. It affixes to the hip belt for easy access to your most wanted items. 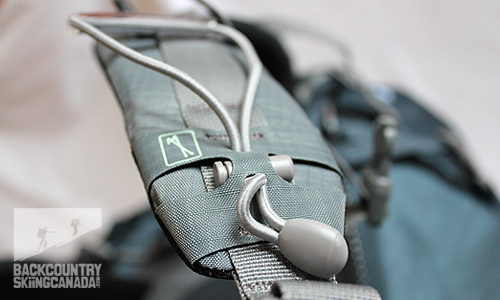 The Digistow comes with its own strap to allow you to wear it off of your pack if needed. The large model we received will easily accommodate my point and shoot digital along with sunglasses and a cliff bar or two. The Osprey Aether 85 backpack works well for multi-day ski mouintaineering trips as it is BIG and can carry alot of stuff comfortably. The zippers and clips are easy to use with gloves on and there are well designed tool and water carrying straps and pockets. The stretch woven front pocket is a good place to stow your skins or extra clothing layers when not in use. To make this a true winner it would be ideal to incorporate a shovel handle and probe pocket somewhere as well as increase the size of the internal water bladder pocket so that it can easily accommodate a shovel. The design is well thought out, the pack has many unique features that only Osprey offers, is built tough, has many add-ons to compliment the pack, and comfortable as they get. The J-zipper panel access is blocked by three compression straps which is not ideal, it would also be nice to have a secondary pocket under the lid for more storage of those quick access items. The sleeping bag compartment separator panel does not provide 100% separation and small items slip through the bottom of the pack, you can remove this panel but it does not have fast clips. Hip belt pockets are also a must for on-the-go items you need quick access to. After two years of hiking, ski touring and mountaineering with my Osprey Aether 85 pack I still think it's a great product. It has taken the abuse of the trail quite well and is versatile enough that I can use it for a multitude of adventures. It has been into the Asulkan Cabin on several occasions as well as Grassy hut on the Bonnington Traverse. 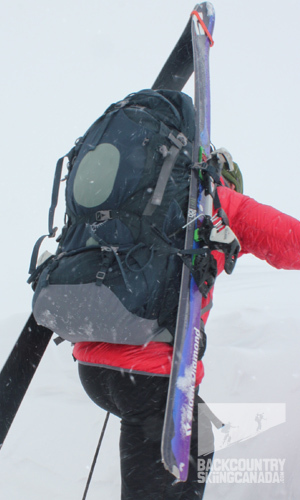 Although it is not designed as a ski touring specific pack it does a really good job of it given all the features it offers and the amount of gear it can haul. It is still the most comfortable large pack I have ever owned and I look forward to many more years of hiking with it. During the spring of 2013 Osprey updated the Aether 85 pack so we gave them a call to see if we could review the new updated version and see what all the new features were about and determine exactly what had changed. That review can be found over here so give it a read and see what's new.